Tank blanketing is the process of applying gas to the empty space in storage containers. Tank blanketing can be used for several reasons. It can prolong life of product inside tank, decries probability of combustion of flammable materials stored in tank or keep contaminants out of a storage space. We offer you customer designed blanketing valves according to your demands. Our experts will help you to determine best possible way to find solution in this area. 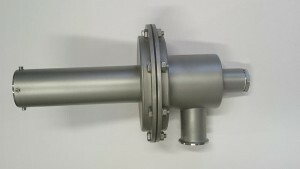 Blanketing valve for inertisation of vessel with 5 to 100 mbar vacuum (adjustable). Injection pressure of inertisation gas is 3 bar.